The Eaton 93PS provides the lowest Total Cost of Ownership and maximum availability in its power range. Providing top of the line efficiency and resiliency, it’s the perfect choice for small data centers and mission critical applications. 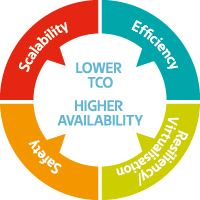 Load shedding – 50% drop in load equates to 250% more runtime!